This is just a brief note to explain how bells are hung and work. This sketch shows a bell hanging from a pivot. Attached to the pivot bar is also a wheel, normally made of wood. Fixed to the wheel is the bell-rope, which normally hangs down into the ringing chamber. 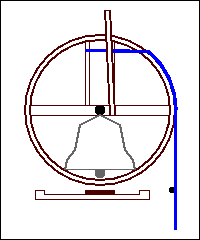 In the DOWN position, the bell hangs down from the pivot. If the rope is pulled, the wheel rotates, carrying the bell along with it. It can only go so far, however, as the rope only passes part-way around the wheel. It then passes through a hole in the rim of the wheel and across to one of the spokes that strengthen the wheel. By repeatedly pulling on the rope, the bell can be pursuaded to swing in wider arcs, until eventually it can reach the vertically up position. 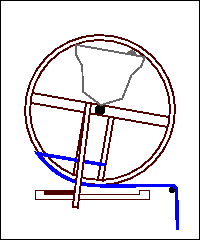 At this point, it is prevented from going further by a wooden stay, which is also attached to the pivot, usually at the other end to the wheel. This comes up against a wooden bar, known as the slider bar, which rests below the bell. This bar is pivoted at one end, and the other end slides in a frame. The bar can slide sufficiently to allow the bell to just pass the vertical position, but no further. Since it slides from side to side, it can allow the bell to come to rest in either direction. Here the bell is UP, in the HANDSTROKE position. It will be noted that there is only a short length of rope around the wheel in this position. Note also that the slider bar has been moved to the left by the stay. A small pulley is positioned so that the rope can still hang vertically in the same line, even though it is wrapped around the wheel in a horizontal direction. 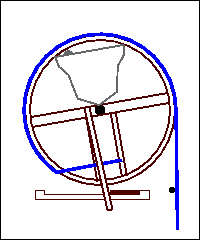 The pulley is positioned directly above a hole in the ringing chamber ceiling (not shown in this sketch). In the handstroke position, the sally on the rope is usually at a convenient height for the ringer to grasp and pull - this is normally around head-height. Here the bell is UP, in the BACKSTROKE position. The rope now passes most of the way around the wheel and so there will be much less hanging down into the ringing chamber. In this position, note that the slider bar has now been moved across to the right by the stay. In the backstroke position, most of the rope has vanished up through the ceiling, and only the TAIL of the rope is still within reach. The ringer must release the sally promptly after PULLING OFF or he or she will go with it! The ringer always maintains hold of the tail of the rope, even at handstroke, when he or she is grasping the sally. Before ringing proper commences, the bells need to be RAISED. This is done as described above, by pulling repeatedly on the rope until the bell can be made to SET at one of the up positions. By tradition, this should always be the handstroke position. When ringing has been completed, the bells are RUNG DOWN to return them to the down position. Bells should NEVER be left in the up position unattended unless special provision has been made for this.